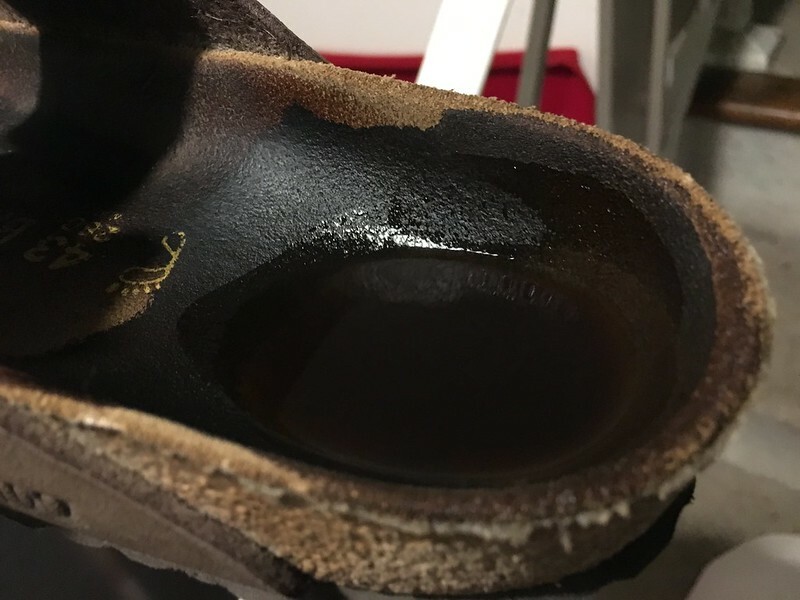 Why is there a puddle in my Birkenstock? When I went to put on my sandals at the front door to walk the dogs this morning, one of the Birkenstocks I was planning to wear today had a puddle in it. It didn't smell like pee, and I honestly didn't think any the dogs could have managed to pee in just one sandal even if they'd tried. Also, it was sitting on the shoe rack, so it would've taken some acrobatics. No sign of a drip from the ceiling, which would've been pretty odd. The coat closet at the top of the stairs is kind of above that, but a few feet away. I headed to the sink to dump out the liquid, whatever it was, and it was slightly brown, which made me nervous. I dipped my finger in it, smelled it... just a faint leather smell. I put on a different pair of Birks and took the dogs for a walk, and it wasn't until I got back and hung up Penny and Carter's leashes that I figured out what had happened. Penny's leash was still slightly wet from yesterday, when I gave her a quick shower after she rolled in something nasty during our afternoon walk. I guess I had hung up the leash right after that shower, before going out to the Bet the Farm Wine Dinner, and it must've been right over just that one Birkenstock. I had created the puddle. Mystery solved. It should be dry in time for me to wear that pair of Birks tomorrow.